We sure do love our dogs, and try to provide them with the best, whether it is healthy dog food or the highest quality products. but sometimes that love diminishes, particularly when they leave the backseat of our cars like a post-apocalyptical scenario. In this case, we ought to think immediately of the best car seat cover for dog. However, this can be quite difficult to find, because there are so many brands out there that your head will start spinning on the spot. We’ve been there, therefore we know how unpleasant and annoying it can be. This buying guide will come in handy, since it will allow you to choose between 5 top-notch products without spending too much time doing research that might or might not hit a dead end. We do not want to beat around the bush. Your time is certainly valuable, so let us not waste it away. In the following, we will present 5 high-rated brands. After reading this guide, you will be able to choose the best car seat cover for your dog. Who can say that a dog seat cover cannot be a luxurious accessory? Pets need to be as pampered as we are. Made with quilted material that is at once waterproof and comfortable, Epica’s seat cover for dog is a decent acquisition. 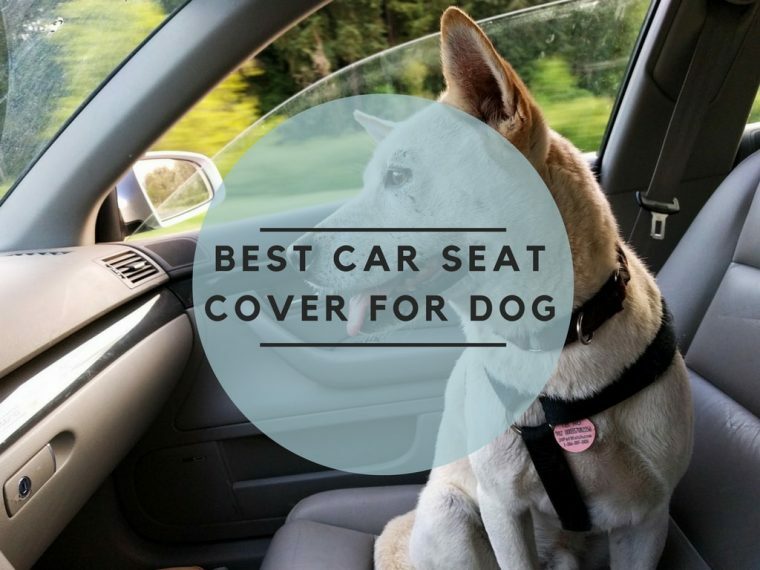 Even though it looks a bit flimsy, it protects your seat against claw marks and paw prints, which is basically what a good seat cover should do. 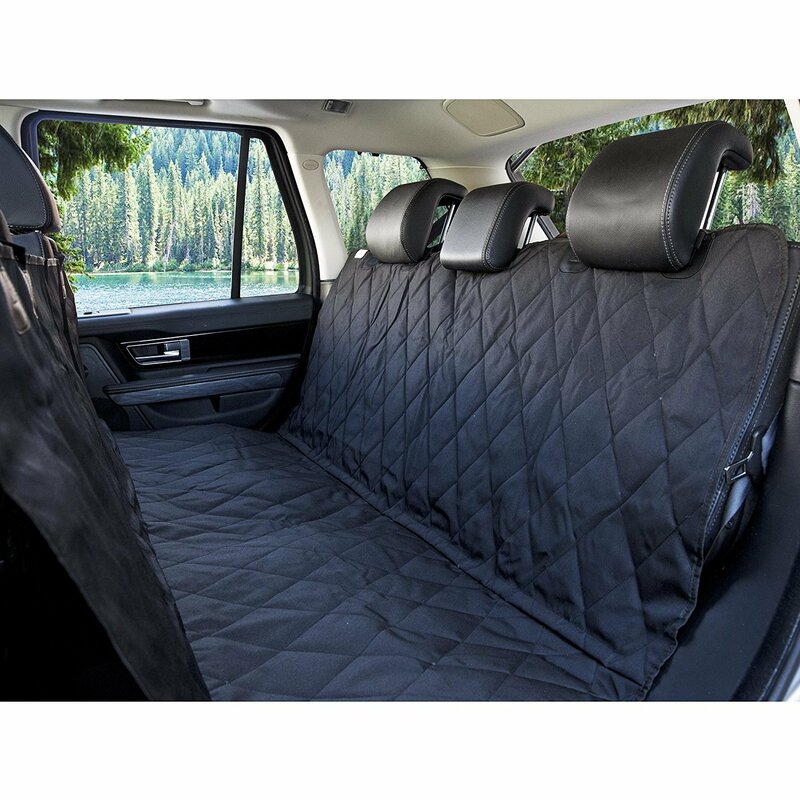 Unlike other covers, this is not rigid, so your pet will be able to relax comfortably while in the car. The product can be installed in 10 minutes, which is yet another perk because most of them have unintelligible instructions. All you have to do is plug the anchors in the seatbelt system and you’re good to go. 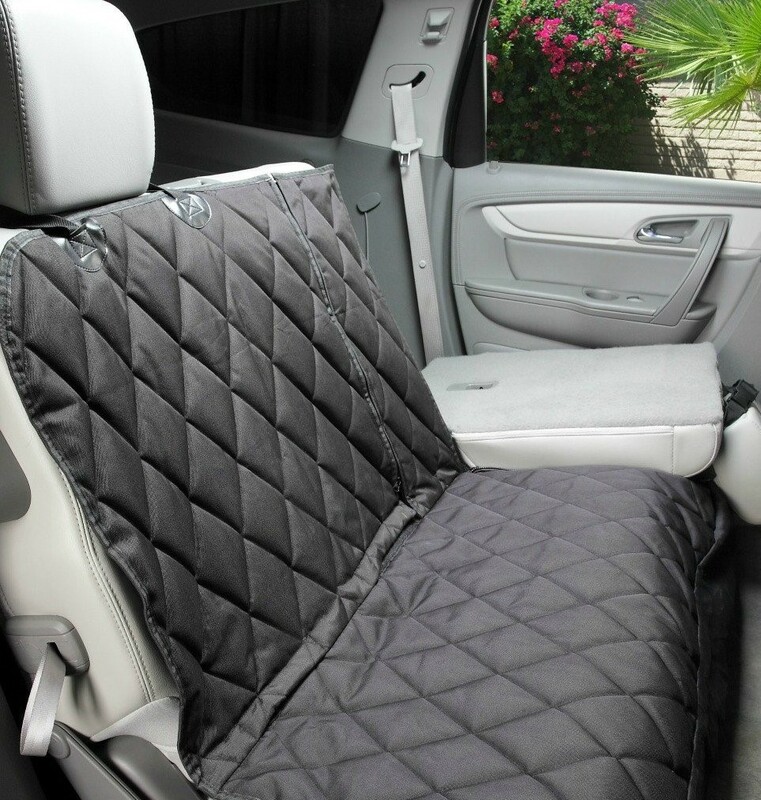 In terms of size, this quilted cover is 56 x 47”, therefore it works just fine in any type of car. Considering that it comes with a price tag of around $30, this brings good quality for a minimal investment. Keep in mind that this is not custom-made for a certain car, so if your seat is somewhat of an atypical one, this might need some tweaking to fit properly. But this is not much of an inconvenience, so don’t sweat it. This particular cover has gotten thousands of positive reviews from pet owners worldwide. They praise its durability, easy installation, protection against shedding fur and the fact that it can be cleaned in the washing machine without a problem. Definitely worth considering if shopping on a tight budget. It has some minor setbacks, but overall it is a good product. We think we can all agree that the best car seat cover for dog must be large enough to fit in all sorts of cars. This satisfies that criterion, as it is 54 x 58”. Unlike the first product, this is simultaneously a bench cover and a hammock. Given that it is quilted and waterproof, you won’t have to worry about the wear and tear that frequently renders your covers unusable. The best thing yet about this car seat cover is its non-slipping property. It also uses Velcro on the openings for the seatbelts. If you’re sick of covers you cannot wash in the machine, this is the solution to your problem. Just make sure you use only the “Gentle” cycle on the machine, lest you rip it to shreds. The installation does not get any easier than this. The cover has buckle straps that go around the headrests in the back of your car. A couple of seat anchors secure it 100%, so you won’t have to reposition it all over again. What makes this stand out from the crowd is the attention to detail that has been put into manufacturing it. Previous customers have noticed that there’s minute stitching on the triple-layered material, it withstands some insane temperatures and it looks gorgeous when installed. All of these features are offered for somewhere in the range of $30. If this is not a good deal, we don’t really know what else could qualify as that. The fact that it has gotten more than 2,000 reviews with ratings over 4.5 out of 5 should let you know how good this item really is. There are a few criteria a seat cover must fulfill in order to qualify as “ the best car seat cover for dog” and we think this has it all. NAC&ZAC’s product is a 3-layered PE material, waterproof hammock that is sure to appeal even to the pickiest of customers. Most pet seat covers today are 2-in-1, in the sense that they are simultaneously simple covers and hammocks. This, too, falls into the same category. While the previous product was gorgeous but lacked the protection of the sides, this is superior in that respect. The first layer of the cover is made of a polyester material that resembles canvas, thus is more durable than it might give the impression it is. The second layer is waterproof, so no liquid will affect it. It works with quick-release clips, therefore the installation is a piece of cake. Some elastic strips confer the cover some much-needed additional security that will be particularly useful if you own a dog that cannot stay put for the life of it. Previous customers have noted that it is a quite large hammock (56 x 63”), so your dogs will be able to move to and fro in the back of your car without interfering with your driving. Safety comes first and this product does offer it. At the moment, this is among the best-rated seat covers on the market, so rest assured you will be getting a product that’s worth the investment. The ultimate choice, of course, is yours, so ponder on your options. We are gradually approaching the best dog seat cover there is. This product on our top is a heavy-duty 4Knines item that has gotten quite an intense attention from thousands of customers. 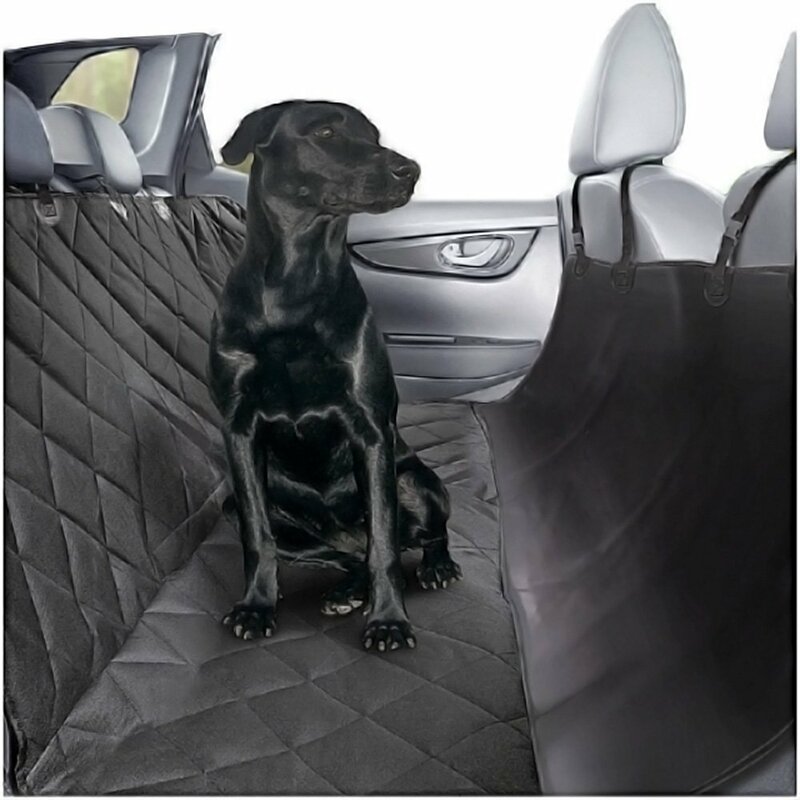 Made with chemical-free premium materials and with an eye to stylish design, this cover makes a beautiful addition to a car that’s used to suffer from claw-marks and other “scars” left by dogs. The cover can be turned into a hammock easily and can be installed in the blink of an eye. What makes this different from other covers is its non-slip surface, Velcro openings and adjustable straps around the headrest. The adjustability of these straps is really a godsend because more often than not, the straps make it impossible for people to use the cover properly. You are on the safe side with this one. Moreover, all these straps are coated against UV. Other two advantages of this cover are the padded material and waterproof capability. Not bad at all for a price that revolves in the range of $60. This can be purchased in two sizes, regular and XL, so make sure you get the one that suits your car best. Also, you can choose between 3 colors that complement the interior of your vehicle. 4Knines’s cover is one of those products you really have to put some effort into finding a bad testimonial for. 80% of almost 2,300 reviews are 5 0ut of 5. We think that says a lot about the quality that went into this cover. Of course, there are some unpleased customers, but that comes with the territory. One simply cannot appeal to everybody on the planet. Here we are, finally: the absolute best car seat cover for dog there is; the infallible Plush Paws. It’s a robust cover that’s 55 x 58” and heavy-duty, literally. That’s why it makes the top of our choices. The product comes with 2 seat belts and 2 harnesses, which is a major perk in comparison with the other 4 covers we’ve seen until now. The material is 600OD Oxford PU, which ensures unprecedented durability. Sliding is annulled 100% thanks to the silicon fabric. It collects hair (we all know how tedious a shedding dog can be, especially when we’re the ones that need to vacuum it) and protects against claw marks even from large dogs. The vast majority of manufacturers advertise one thing but you end up with a subpar product. We are happy to say that this is not the case. This is, by excellence, the sturdiest cover there is, and we are not exaggerating in the least bit. Previous customers agree with us. It is installed easily and it stays that way. It does not keep on moving, like so many other covers. Plush Paws’s product has broken the market. Pretty much all reviews put the cover in a very favorable light. We decidedly joined the masses of happy pet owners. We’ve had it for half a year but it looks and works as if it were brand-new. “What brand manufactures the best car seat cover for dog?” – this is a frequent question and it has multiple possible answers. We’ve seen 5 brands until now, so perhaps we should delve a little deeper and see why these are the best. BarksBar has been in business for quite a while and has built a good reputation for itself. The company sells all sorts of pet accessories, including seat covers, of course. If you ever need dog doors, orthopedic dog beds or a well-done seat cover, you can count on BarksBar. As you will discover in the testimonials, the manufacturer makes no compromises in respect to quality and durability. NAC&ZAC was formed by a group of pet enthusiasts that started to manufacture travel products for pets. They retail seat covers, car door protectors, hammocks, seat belts, liners and net barriers, among others. It is without a doubt one of the most famous US manufacturers of items and accessories for pets. Epica is somewhat of an obscure band that has not enjoyed too much attention from the public. Nonetheless, it provides some state-of-the-art travel accessories for your pets. We’ve seen one of their products in our top and it was quite well-placed among the others. This stands to show that Epica, though not as known as other companies, is focused on progress before anything else. Plush Paws is 2-years old as a company, but it has become one of the best in business. The company has a wide array of products for pets, from covers and bowls to protection kits and cargo liners. Whatever it is, you’re sure to find it in the catalog of this young but determined company. 4Knines was formed by dog owners just as yourself. They sell pretty much the same products as all the brands we’ve taken a look at until now. If you’ve read the top correctly, then you’ve seen that their product came on the second place. Not bad. If high-quality is what you aim for, then 4Knines is happy to provide it. No matter what it is you’re about to buy, you should never make a hasty decision because you risk overspending for a product that leaves a great deal to be desired. In the following, we will outline some of the things you should keep an eye on when you’re hunting for the best car seat cover for dog to help you decrease your car cleaning time. 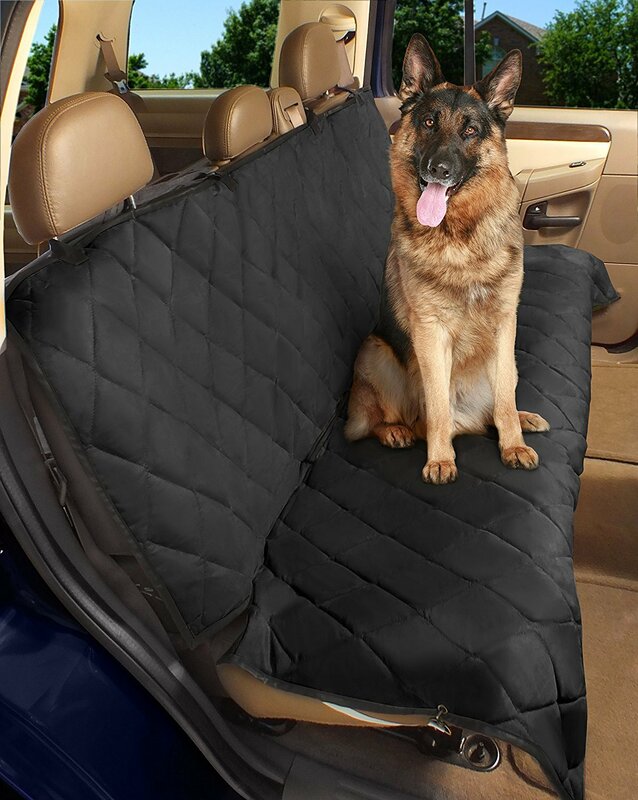 A dog seat cover must withstand claws, liquids, paw prints and several other “scars” a pet can inflict on it. If it’s made with a low-quality material, it will get wear and tear a lot sooner. This means you’ll have to buy another one in a couple of months or so, and that’s far from a good deal. Vinyl and polyester are both good choices, even though the former is usually weaker and can still get ruptured by claws. The sturdier it is, the longer the cover will last and the minimal your investment will be on a yearly basis. If you take a good look at some reviews for any given dog seat cover, you’ll see how many people complain that the covers they’ve bought do not fit in their cars. That is by no means the fault of the manufacturer. Each product comes with a specified size, so make sure you order nothing but the product that will fit properly in the back seat. If it’s too small, the sides of the bench will be exposed. If it’s too large, it will fall off as your dog runs around. 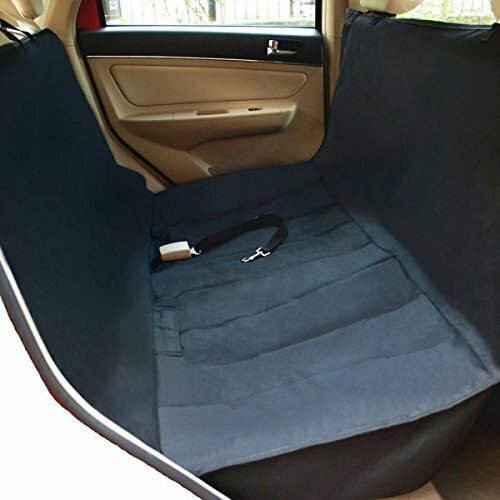 The size, along with the material, is the most important aspect you have to keep an eye on when shopping for the best car seat cover for dog. If your puppy/dog is not “potty trained”, you’ve got a problem. Purchasing a waterproof cover, in this case, is a must, unless you want to clean the car every time you take your pet for a stroll. And even if you have a dog that is trained, we recommend you to get a waterproof cover, just in case. PRO Tip: Do not assume that manufacturers won’t lie in respect with this aspect. Many covers that are presumably waterproof are anything but. You can stay on the safe side by reading some of the reviews for the product you want to purchase. If people say it is waterproof, then you won’t risk flushing your money down the drain. If a cover isn’t machine washable, you’ll have a lot of difficulties in cleaning it. No one washes things by hand anymore, because it is so time-consuming. Moreover, the machine is able to get out even the most annoying stains and wash the fabric in depth. On the same topic, do not put a cover in the machine if it’s clearly not machine washable. You’ll get it out in shreds. If possible, try to aim for a cover that can be transformed into a hammock. This will make a huge difference in your life in the case in which you have a small dog that’s used to just jump in your lap whenever it pleases. What’s more, a hammock provides more space where your pup can play to the point of exhaustion. If it’s a long trip, you’ll see that yes, it does matter to have this playing ground for your dog. You’ve read a few reviews here, but now you’re probably wondering “Which is the best of these?” Well, the winner – at least for us – is the Plush Paws cover. It’s simply better made than all other covers we’ve seen in this guide. Unlike the other brands, it is endowed with numerous features that make it durable, as well as more secure on the bench. In addition to these, it does not slide off the seats, like so many other low-rank items do. And of course, we must not overlook the financial part: it’s much cheaper than others, but it offers real perks. The manufacturer does not use lies as marketing tools. Unfortunately, many other companies do, that’s why you end up with products that go in the trash after a couple of months. Even though we’ve found the Plush Paws cover to be the best one in our top, you can choose any item presented in this guide. As you’ve seen, all 5 products are high-rated, therefore you can’t go wrong with any of them. Finding the best car seat cover for dog can require a lot of effort. Fortunately, you won’t need to scour the Internet high and low trying to come up with the best solution. We’ve done that for you! We hope this guide was useful to you. If you have any other questions or uncertainties concerning seat covers for dogs, do not hesitate to contact us and we’ll happily solve your problems!